When the children walk in, there’s no shyness. They grab a book or other materials, such as flash cards, greet the Wilfrid Laurier University students enthusiastically and settle in with them to work on their French. 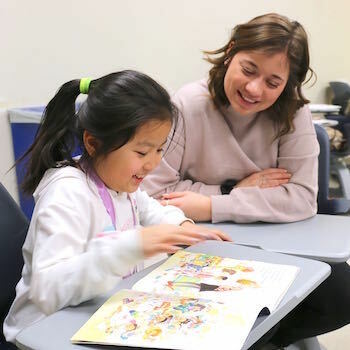 The children and Laurier student volunteers are participating in the French Reading Circles program run weekly on the Waterloo campus by student group Laurier Students for Learning. The group also puts on a Saturday Morning Reading Circles program in English. Both programs are open to any elementary school student who wants to work on their reading and/or vocabulary. For the English circles, program leaders keep track of the words children have trouble with as well as the books they have read. This helps them recognize the progress they have made. Particularly in the French circles, there is a strong focus on vocabulary and comprehension as well as reading. “I know some of the parents don’t speak French but their children are in French immersion, so they want a place they can go where their children can have extended one-on-one time with someone who does know French,” says D’Alessandro. This is the case for Wendy Zhang, whose daughter goes to the French circles almost every week. Sandra Ribes’s six-year-old son, who is also in French immersion, goes to both the English and French circles in part because the family tries to stick to speaking and reading in Spanish at home. After about 45 minutes of reading with a volunteer, both the English and French programs bring in educational games and activities, such as crafts and songs. Seven-year-old Alexandra Zhang likes both the reading and the activities. “It’s fun because I get to learn new stuff,” she says. Some of the student volunteers get involved to build their experience because they’d like to become teachers. That’s the case for Hyder and Olivia Hahn, the club’s vice-president. Other volunteers, such as D’Alessandro, just enjoy working with kids. A similar club at Laurier’s Brantford campus, Laurier Students for Literacy, offers a free homework help drop-in program at the Brantford Public Library. Both the Waterloo and Brantford clubs are open to both new volunteers and new child participants. The exact Waterloo campus locations for the French circles and English Saturday morning reading circles can change. For up-to-date information, see Laurier Students for Learning on Facebook or email lsfl.waterloo@gmail.com. Note that there are no programs on Saturday, Feb, 17, Wednesday, Feb. 21, or Saturday, Feb. 24, during Laurier’s Reading Week.